Suffused with the energetic principles which underpin natural medicine - an essential resource for practitioners [Dr Stephen Gascoigne, M.B. Ch.B, Medical doctor and Herbalist]. I wholeheartedly agree with Dr Gascoigne's endorsement of this super new book by Christopher Menzies-Trull. Unlike many textbooks, it never feels like hard work when reading through each chapter; the language used is straightforward and thus all the concepts and facts are easy to understand. The author's clear, smoothly-flowing style takes the reader on a fascinating journey through an array of well-ordered chapters. There is a wealth of detail in this volume, yet it is presented concisely. The book has 671 pages (including an excellent index ) but you will be surprised how quickly you will read it, because this truly is a book that you will not want to put down until you have read it cover to cover. Herbalists, nutritional therapists, Naturopathic practitioners, pharmacists, holistic doctors and therapists will find this a delightful desktop reference book, with its very clear format. Students will also be engaged by its consistently interesting content and will feel further inspired to pursue their studies with passion. Most of us will have been students at some time in our lives; we all remember teachers whose lessons we looked forward to, because they made the subject exciting and explained it well so that everyone could understand it. Christopher Menzies-Trull is one of those charismatic teachers, whose passion for his specialisms truly permeates the pages of his book, and this gives his writing that engaging quality that elevates a book from being good to being excellent. The book begins with a look at historical aspects of Herbal writers through the ages, then moves on to describe the philosophy of Physiomedicalism. Sequential chapters guide the reader through the topics of vitality and vital force, functional associations and functional changes, contraction and relaxation of tissue, principles of physiology, trophorestoration, symptomatology, diagnosis, pathology and prognosis. There follows examinations of what is health and what is disease, Naturopathy, nutritional regimes, vitamins, minerals and trace elements and principles of treatment. The author has compiled thoroughly researched and well-referenced chapters on all major medical subject areas, each containing the recommended herbal, naturopathic and nutritional treatments for the myriad of conditions described. Ophthalmology and Aurology, Respiratory medicine, Cardiology and vascular disorders, Endocrinology, Gastroenterology, Urology, Urine analysis, Immunology, Neurology ( of particular value for practitioners working with clients who have mental or emotional distress ), Dermatology including hair and nail disorders, Rheumatology, Paediatrics, Tropical diseases, Obstetrics and Gynaecology, Oncology and Geriatric medicine are all comprehensively covered. There is an explanation of active compounds in plants, preceding the herbal pharmacy and herbal pharmacology chapters. Professor Elizabeth M Williamson [Editor, Phytotherapy Research; The School of Pharmacy, University of Reading ] who has also reviewed the new book, has highlighted that not only are methods of extraction and formulation carefully, but the reasons behind certain processes are also given, together with examples, helping the reader to develop their own expertise based on sound knowledge and understanding. 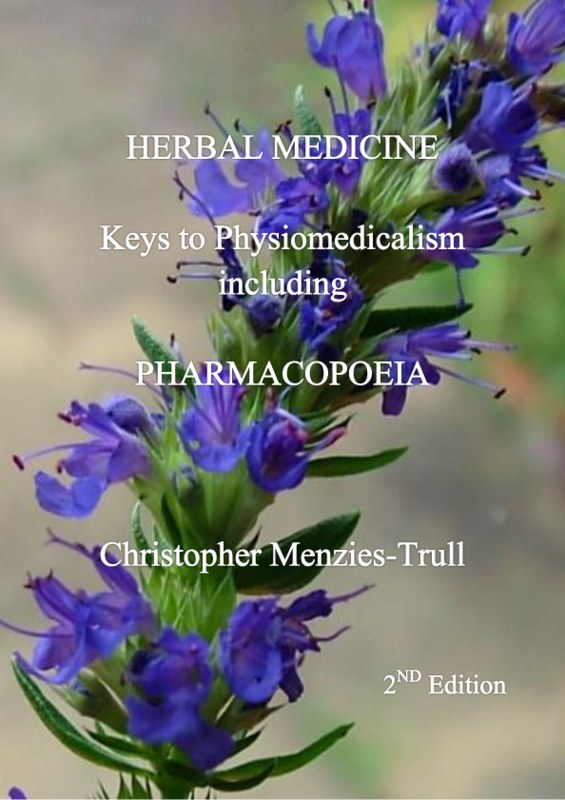 The pharmacy and pharmacology chapters herald the beautifully presented pharmacopoeia section of the book, which contains 413 herbal medicine monographs. Readers will locate with ease meticulously detailed information about remedies ( botanical and English names ), constituents, herbal activity, medicinal indications, tissue conditions, cautions, preparations, external uses, dosage and mode of application and the relevant references and research. Additional topics featured in the compendium are pyrexia, therapeutic classes of medicines and emergency herbal medicine. The emergency herbal medicine chapter is for the bravest of trail-blazing herbalists. The author's thirty-four years of practical experience as a Herbalist and Naturopath has been deftly distilled into this succinct and highly readable textbook, which is an essential reference book and practical manual, all in one hardback volume. Dr Emily Lyons, M.B. Ch.B.